Imagine that you are about to lead a discussion in a subject that you teach. Based on the required and any optional readings, what aspect(s) of leading or preparing to lead a discussion stand out to you as the most important, and why? Having students be aware of an “I agree” versus a more substantial post. They should also understand how the grading works for both. Having students understand when to start a new thread vs continuing ideas in an already existing thread. Having it in an environment where it is easy for me to keep track of who posted, when they posted, what they said, and who they were responding to. Having it in an environment where students can easily keep track of what they posted and where it was posted- our set-up of Moodle 2 does not seem to allow that to happen anymore. I have not played with my Moodle set-up enough yet to see if Moodle2 can do it at all. Having students’ email addresses so I can reply to them privately and off of the discussion board. Encouraging students to share their ideas. 2a. What obstacles have hindered the use and effectiveness of online discussions in a class you have taught or taken? I would love to respond to both of these, but for now I will just address the first one because most of the discussion areas in the BSU classes have been less effective for me than they were in the community college classes I took online. Actually I was really spoiled in Alex’s classes because they were so well organized and were really easy for me to follow ideas, figure out where I had posted so I could see if anybody replied to my posts, and they were very safe environments. I was as clueless as my peers in those classes. Students do not start their own thread with their initial post. The deadline for the initial post is not set at a reasonable time frame. The deadlines for follow-up posts are not set for a reasonable amount of time after the initial posts are required. I have used VoiceThread with students and found grading their discussion to be a nightmare. I did this before I even had a clue Moodle existed and at the time was the only safe way I could figure out how to enroll students onto a discussion board. I used space at a “free” phpBB board and often tried to get students to be able to do discussions there, but there was always some logistical hang-up that got in the way. I don’t know php and don’t remember why I was not able to get students to engage with that setting, but the phpBB’s failed and VoiceThread was more energy consuming than effective. In one online class, our discussion board was a list-serve. Yeah, doing discussions via email was less than organized or productive. WebCT with new science teachers. Here we discussed various ways of teaching different science concepts with our students. It was with the eMSS program, of which I was a part from 2003-2007. I was a facilitator in the chemistry area for two years. Blackboard with my student teachers. I used to teach science student teachers. They were required to do a reflection each week. The first year I taught with the program, I followed what I was told to do. Students emailed their reflections to one of the two instructors who by themselves gave feedback to the student who sent in the reflection. I wanted to make the reflection part of the course more interactive because I am not the source of all knowledge. Our students were very talented people who also had good ideas or may have been able to commiserate. I was able to talk my co-instructor into letting students turn their weekly entries in to a discussion board in the Blackboard course I set up for our class on the weeks they were to be turned in to me. She did not want to bother with Blackboard or to share the authority on teaching with the students who were obviously too inept to share constructive ideas with their peers. What little I was able to do with my student teaching graduate students was as good as I could hope it would be given the opposition I faced from my superior co-instructor. This happened fall 2005. I did get to use Moodle with my students once and that worked great for me, but since it was their first time, our product was not as good as I imagined it could be. I did not know how to use Moodle at that time so I was learning how to use it as they were. I had facilitated discussions with WebCT many years before so I knew the concept of a threaded discussion, but Moodle was a new environment. My students wanted to use Facebook but our IT person told us at the beginning of the year that we were prohibited from using fb with kids. That, of course, did not stop the cool teachers from using fb with their kids so my popularity got another ding by not using fb. I took a SQL class online where we had to turn in our homework assignments to the discussion forums. Our instructor set it up so that you could not see what other people posted until you posted your solution. This was effective because you could not cheat by looking up the answers before posting your own solution. Plus after you posted your ideas and then you saw how others solved the problem, then you could learn from your mistakes. She did have a discussion forum set up for each week’s major assignment where we could post questions to solicit help from the instructor or our peers. I almost failed the course, but not because of how the discussion forums were organized. 2b. Based on your experience with online discussions as a teacher and/or a student, what techniques do you consider most effective for soliciting interaction and critical thought? Are there experiences you have found particularly fulfilling or frustrating? How do you help students interact effectively in an online course? A few of us have posted examples of how we help students interact effectively in our discussion areas. Although Chris has not held online discussions with students, she likes the small group approach. In addition she likes the idea of having students be facilitators. Bret confirms the importance of using multimedia and unique opportunities to engage a discussion. James also likes the idea of having student facilitators and freshness to the content, but cautions against overwhelming the students with too many new ideas or tools to learn. Sarah points out facilitator involvement is crucial, yet the facilitator needs to be careful to not become the discussion. Let the students be the discussion by finding a balance between facilitator input and student contributions. Earl stresses modeling effective communication so novice participants experience what they are expected to do in the discussion. So far our discussion has focused on group size, discussion format or setting, facilitator involvement that may involve student facilitators, and modeling what we expect of the participants. What other suggestions do you have about how to get students to interact in a discussion forum or even with wiki collaborations? We have a few more days left for this discussion, so please provide examples from your classroom, experiences with online learning, ideas from the readings, or unique perspectives you’ve acquired while in this or other online classes. What has motivated you to interact in our online courses? How do you sustain online discussions? A few people have shared aspects of online discussions including how the discussion is launched, what happens during the discussion, and how to prolong it. Kathryn stresses the importance of using open-ended questions to allow for freedom of expression of ideas. Bret cautions instructors to not assume that an open-ended question will guarantee student participation that stays focused on the topic. How would you build community building into the online discussion that may be more natural to create in a face to face environment? Sarah seeks the perfect balance between structure and flexibility. What suggestions do you have about how to create flexibility while still giving enough structure so students feel safe in the environment? Earl suggests extending discussions with hypothetical situations. With that in mind, what do you suggest we do to get people who have not posted to this discussion yet, to post to the discussion? Do the facilitators send out personal invitations to the discussion? Do we respect that for this discussion we are graduate students and therefore have the choice to participate or not? If you are working with adults like we are, but who may not be as comfortable with the online world as we are, how would you lure them to volunteer their ideas in an online discussion? How do you keep a presence in online discussions without taking over the conversations? So far, everybody recognizes the importance of having the facilitator being a part of the discussion. Kathryn points out that creating a social presence by providing feedback to participants. James suggests instructors target the posts that are not getting many responses by replying directly to those ideas in an attempt to stimulate discussion based on what is said in the neglected posts. Sarah’s audio file was not loading at the time I crafted this summary. Jessica recommends brevity while including leading questions to further the discussion. How do you suggest a facilitator follows these recommendations without overwhelming the discussion? How does one provide feedback, but not so much that it curtails further discussion? How do you use online discussion in your blended courses? So far we have heard a few ways people can use online discussion areas to allow for collaboration or submission of individualized perspectives on a topic. Glori has her students do mini-case studies by perusing the literature and deciding what they would incorporate into their own practice. Adam does a sort of jigsaw where he posts questions about themes in geography and allows students to self-select which ones they will respond to. Then he challenges students to visit a different theme and contribute to its thread. Bret confirms the uniqueness of using discussion forums as a review area for essay exams. He commends Adam for using the discussion area to stimulate student interactions and follows up with questions about procedures for doing such discussions. Kathryn suggested using the discussion areas as a place to do summarizing activities or for students to provide feedback on the course without having time constraints you can have in the face to face classroom. Sarah not only uses discussion areas as a place for students to brainstorm, but since it is out in the open, she can also give feedback and approve their ideas before students prematurely commit to a topic that may not be as fruitful as originally anticipated. What are some other concrete examples of ways you can engage students in an online forum? I restrained my participation in Module 4 because my style of taking online classes is not congruent with how this class is organized. I am changing what I normally do to meet the expectations of the class. This is not the only time I have had to change my behavior so it is not a big deal; it just decreases my enthusiasm for doing the reading or for challenging me to think or to come up with new ideas or solutions to problems. In contrast, the discussion forum Bret and I did was not totally new to me, and I appreciate that Bret was open to having our discussion’s focus center around a video instead of a paper. I went hunting for various videos on how to hold online discussions- there is a playlist at my mgetzedu YouTube channel if you want to see what else is in the list that I put our video in. The video we used better fits my way of doing discussions because as Bret taught me, we could have a different panel per main idea. We did not have to squish divergent ideas into one thread- they could be spread out and people had a choice about where they wanted to post or not post. Viewing the responses, we stayed consistent with the topic within a panel instead of being bombarded with too many divergent ideas in the same space. The ideas were focused around a question that had sample answers in the video clips. If nothing else, I hope people learned how they may be able to use Voice Thread with their classes. Voice Thread can develop a discussion in both a horizontal and vertical direction- horizontally it has breadth whereas vertically people can develop one aspect to a lengthy degree. Since we do not have a large class like we do in public school, we did not get to see the full extent of chaos that can happen when inexperienced people participate in VoiceThread. The discussion board was a success. I was able to try out the discussion techniques I was taught for the eMSS program and through the PBS online facilitator’s class. It has been a long time since I’ve had an opportunity to facilitate so it felt great to be able to do it again. This was my first chance to try landscaping posts and rereading them, I am not sure they are as succinct as they could be, but they are not that bad either. The personal emails to initial posters got some pretty good feedback and it let me develop more of a relationship with a couple of my peers. I am glad to see some people had the time to visit the VT discussion and tried the various ways it lets you communicate to others. Reflection of: Use your checklist/rubric and assess 1 of your own postings from previous discussions. Did you meet the criteria outlined in your own assessment tool? When did I post? Satisfactory because it does not start a thread and it was later than 4 days after the discussion opened. What did I post? Satisfactory because it is on topic, demonstrates a perspective that has not been mentioned yet, and stimulated at least one other person to share an idea. Although my idea did not stimulate several other responses, what people said in response to what I said did stimulate more conversation. Usefulness of post? Satisfactory because I do not think what I said was inspirational enough or relevant enough to other people for them to care about the need to have introductory courses for students new to the online environment. Just about every successful school I’ve attended or taught with has had minimally an introductory lesson on how to use the LMS so I thought it was relevant to bring it up in this particular discussion. What changes might you make in your teaching practice based on what you now know about facilitating effective online discussions? I wish I had an online teaching practice so I could make changes. I am still at the beginning of my online career. Although I have a lot of experience with taking classes online that included discussion forums, I do not have much experience facilitating courses online. I am sincerely hoping that I will one day get to use what I have learned in this and other BSU classes so that I can contribute to other people’s learning. In EDTECH 523 we created a synchronous presentation and were required to watch other presentations as well. To focus on other people’s presentations, we were asked to create an evaluation guide that we could fill out during the presentations. After the groups finished, we emailed our presentation form to the respective group. I’m connecting to my evaluation instrument by having a link to it here as it was uploaded to WordPress. The other link is to it living in my Google Doc area. Finally, I did a copy and paste of the document and put it at the end. Purpose of this assignment: Create an evaluation instrument for evaluating the quality and appropriateness of synchronous instruction. Students do something in the classroom other than just sit there. Ppt slides are uploaded to a share screen or are shown from presenter’s computer as a shared screen. Students use whiteboards or the equivalent to answer questions. Complete the required reading and review materials provided on synchronous tools and strategies. Develop a lesson to be delivered synchronously using appropriate instructional strategies. Create an evaluation instrument for evaluating the quality and appropriateness of synchronous instruction. Post the completed evaluation instrument and your reflections to the Evaluation of Synchronous Instruction forum in the MAIN discussion board. Please, also submit your completed evaluation instrument to the appropriate link in the Module 5 activities for grading. Submit discussion idea and/or lead a discussion. Participate in ongoing discussions. Apply critical thinking and questioning strategies to your discussion posts. Module 5 was fun because it got me back in the Adobe Connect classroom which is always a challenging environment to be in because it is so convoluted. Preparing for Bret and my synchronous lesson has also been fun because it is collaborating with someone who is intelligent and knows more about our topic than I do. This means I get to learn something while doing this project and have someone who can patiently handle my questions when I get lost. In contrast, since I bought the Adobe eLearning suite in the fall, I have Adobe Presenter which takes PowerPoint files and uploads them to the Adobe Connect server. It was a nice opportunity to refamiliarize myself with the software. My evaluation instrument was somewhat incomplete so I revised it as I reviewed the synchronous sessions. Interestingly, when I evaluated the Photoshop lesson presentation I realized I had not planned on evaluating something that was not necessarily like something listed in chapter 6. Bret and I have been trying to figure out how to adapt what we want to do to fit one of the suggested activities in chapter 6 and still be within 10 minutes. I think we have a clue what to do and I hope everybody who wants to be a part of our audience will join us and the other presenters on Thursday, May 3. It was also a relief to see that there will be at least six people in our audience. We were not sure what type of audience we could count on so we can now plan breakout rooms and student activities better. It makes sense that chapter 5 in the Learning in Real Time text is applicable to Module 6 since it covers formative assessment, how to integrate it into the class, and how to pick up on non-visual body language. Since that chapter may need to be a part of the Module 6 reflection, I won’t go into more depth here. I will share a few ideas about chapters 4 and 6, though. For chapter 4, I found their analysis of various online teaching settings to be accurate based on what I’ve experienced. I used to IM with my students when they had a quick question and at times we would mosey on over to our virtual office to use the whiteboard for further explanation. Explaining dimensional analysis through IM can be done, but using a whiteboard is much easier. Although I have never taught or taken a class in a MUVE, I think that is what second life is like so I expect I will experience it when I take the class that has us use second life. Although I’ve attended webcasts, I’ve never led one. Although I have had a few online teaching opportunities, I’ve never actually been able to hold an online lecture or class session for students who were expected to be physically present. My current teaching situations are one-on-one and my previous one had live sessions as optional features for the students. I could do them as often as I wanted to, but they were never required to attend a session. I hope that one day I do get to have a real online class with real students that will be “my” students that I get to usher from one lesson to the next. The activities in chapter 6 will be very useful once I have the setting and the bodies with which I can practice. Module 6 is where we teamed up with a partner to plan a live presentation for our peers using the Adobe Connect software. This is the reflection I wrote after Bret and I did our presentation, which was a fantastic experience. I did not get to enact all that was suggested in chapter 5, in part because I was not a solo presenter. Also, since we were doing a round-robin of classroom jumping, there really was not a way to be prepared enough to welcome people as they entered. I understand that it was difficult to get people in as guests and Bret and I learned that barrier early on. I think this is why he came in our room as a guest and had me turn him into a host. Somehow everybody was turned into a host so it did not matter that Bret did not enter as a presenter/host. In some ways, the software is too friendly by putting a cookie in our machine and not making us re-register for each room. That is why I used my Mac when I was a participant and my PC as the presenter. I anticipated quick room changes and knew I’d mess it up if I tried to enter the other rooms while using my PC because the PC is cookied. It is not reasonable to expect people to have 2 computers to do this lesson so we could not expect everybody who had already presented to be out of the presenter registration. I think that is why so many people showed up as hosts when they entered the room- their machines were cookied and it is tough to remove that status. I guess since I spend so much time trouble shooting things because I often find them difficult to maneuver through quickly, that it proved to be an asset for me to know the Mac would work fine in the guest position. Bret and I also used the Mac as a guest computer when we prepared for our session. Since we could not talk very clearly when we were not in the same room, it was hard for one of us to be presenter and the other to be guest when we practiced. I signed in to our room as a guest from my Mac laptop so I could see what the guests would see during the presentation. That is what taught me how the breakout rooms work. I could tell that putting ‘Mel on the Mac’ in a breakout room did not stop “her” from being a part of what was happening in the main room until the “start breakouts” button was pushed. Part of my nervousness in the beginning of our presentation was being afraid everybody would let their curiosity get the better of them and they’d move themselves out of the breakout rooms before we started them. The plan was originally to keep people as guests because we did not want them to play with stuff that was already set up to go. Fortunately we are working with adults so my fears were unnecessary. Everybody behaved themselves as perfect students and none of our tricks got messed up before they were delivered. The backchannel- Bret and I did not necessarily see eye to eye on the backchannel, but this was not my place to be the total control freak so I went along with our main chat area being a backchannel. I don’t know if Bret has ever participated in a backchannel chat during a real presentation. I’ve actually only done it once, and that was when it was being taught to me at an ASCD presentation last year. I wanted there to be a backchannel and a real chat area, but it would have been too chaotic in the short amount of time we had. We named it the backchannel anyway so people could see that if they had enough room on their screen area, they could have 2 chat windows during their presentations- one for real concerns and the other one to be social. I am biased toward letting people use presentations as a way to make friends because sometimes not everything that is said needs to be heard. That was another place I was not able to communicate well enough to get it into Bret that he did not need to do a lengthy introduction to what an LMS is. In our last practice he did narrow it down to maybe 2-3 min of talking, but today he went for more than 3 I would guess. I know my patience started to wane and I came close to just sending out the polls while he was talking. If you think today’s presentation was long-winded, you should have seen it during our first practices. I respect Bret because he wanted people to learn something during our presentation and he really is an expert on today’s talk. That is one reason we did this topic; it is relevant to what we may do as teachers and Bret had to do something similar for people in his district. Plus it had so many components that let us expand it in ways that let us play with Adobe Connect. Bret did a fantastic job of outlining our expectations and establishing the norms for our session. You may have noticed that he built it in to the beginning of the PPT slides. He designed the presentation slides and let me go crazy with Adobe Connect bells and whistles. We somewhat followed the suggestions given starting on page 84 where there is one main person up front and someone else behind the scenes. I did not do all of the logistics alone; Bret helped with setting up the 4 types of polls and how to space everything so it would be ready to be used when we needed it to be there. I took care of naming things in a way that would make sense to us and others, putting the exit survey in a website link pod, uploading files for the file share, and creating the exit survey in Google Forms. Since I bought the eLearning suite when I was taking 521 I wanted to play as much as I could with the software. For some reason I could not get Bret’s slides to upload correctly so he did a screen share for our presentation instead of it being a file he used from the EDTECH servers. It would actually be really cool if the eLearning suite was required instead of the other CS5 suite because then we could possibly have lessons on how to use Adobe Captivate. I’ve only played with it once, but that is something that would be an asset to know how to use for online teaching. Dreamweaver , Flash, and Photoshop are also a part of the eLearning Suite so if you get to make suggestions to the department, you would not be too out of line if you suggested having the department use the eLearning suite in the future. Students writing on whiteboards. I knew it could be done, but had not experienced it myself in Adobe Connect yet. Actually I don’t know if I knew there could be interactive whiteboards in Adobe Connect. Had I known, we may have set up a whiteboard for each breakout room instead of using notes windows to record student interactions. Students could format their notes screens. When we pulled up the Notes screen for group 1, they had done some formatting. That was so cool. I don’t know if anybody else noticed it, but it was neat to learn that students could take ownership of some of their output if Notes pods were used for collaboration. I am still not sure what Adam did so we could move things on the whiteboard. I may have to email him to see if he can tell me. Adam did the music lesson, didn’t he? I liked Barry’s equations on the board. I had not thought of being able to pre-arrange whiteboards for each student until I thought about how to use what he did in his lesson. I do not expect you have had a chance to read my feedback to him yet so I will also mention it here. If I knew who my students were that were going to show up, I could create a whiteboard for each student. They come to class and put up a problem on their whiteboard while they wait for others to arrive. Another way of doing it could be to “seed” the whiteboards with problems and assign the whiteboards to students as they arrive. They would put up their work so they could explain it to the rest of the class during the session. This sort-of ties in with what Janette and Earl did with the chat windows. Even though we followed directions and only wrote on the chat screen we were assigned to, I wonder if they could have been set up to be pre-assigned to students and restricted from others being able to write on them. I had not thought of using chat windows as a way to run small discussions. Watching that process was very useful. I liked how Chioma used the chat window for formative assessment- she kept us alert because she was asking questions that required feedback. Even though I was a little disoriented because her Adobe Connect window would not open on the Mac at first, I found her technique to be effective. It was quick and she could use online learner cues (p.82) to gauge participant interest. Travis and Kirkland were very creative by having a game be the final assessment. I also found it interesting how they assumed everybody should know how to do a screen-shot. Is that the level of our online students? Do they know all of these techniques? If I did not have Snag-It I would be at a loss for how to do screen shots and actually use them. The only problem I had with the presentations, other than them going at a pace that was a bit too fast for me to be comfortable with the changing scenery, was that there were not enough of them. I thought we were excluded from the rest of the spreadsheet because we were not welcome in other sessions so I did not try to be a part of them. Now that I see how talented my peers are, I wish I had been. I learned something from everybody today. It did not matter if their presentation had been memorized, polished, perfect or not, everybody offered something unique that let me walk away with more than I had arrived with in my bag of tricks. Thank you for this opportunity. What are appropriate assessment strategies in synchronous and asynchronous delivery methods? I think formative assessment is more readily done in synchronous sessions because the feedback is instantaneous. It could be done asynchrously, but the instructor won’t know what the students are thinking until the student remembered to turn in his/her assessment. In both cases, written assessment where students analyze something can be effectively done. Does this look different than assessment in traditional classrooms? How and why? I think it looks somewhat different online than in a traditional classroom because students who are afraid to volunteer an answer in the classroom will often speak up online. Even today, everybody participated in Chioma’s questions. She did not call on single students like what normally happens in the traditional classroom. This is one reason I want to be an online teacher and enjoy being an online student. I hate answering questions in verbal face to face discussions, but as you have seen, I am quite prolific online. I know I am not unique so I wanted to used online discussions to compliment the ones we did face to face. Once again, I assert that hybrid instruction is optimal because the learning environments are diverse and can cater to the diversity of our learners. 1. Teacher expectations for students are clearly stated. One of the most frustrating things students face is not understanding what they are expected to do. I intentionally gave ambiguous assignments in the face to face classroom because I wanted students to be creative with their final products. I often hesitated to give examples because I feared I would get clones of the example and often when I did give an example that is exactly what happened. One advantage to me giving ambiguous assignments in a face to face classroom, though, is that my students knew they would see me in person at least three times a week. I made myself available at lunch and after school to help them figure out how to do the project. There were many afternoons that I would be in the library with them, sitting next to them, to help them figure out how to complete the assignment that involved technology. In the online environment, I can have office hours, but physically stalking down a student and inviting him to collaborate with me is not realistic. Another advantage to the face to face setting is that I can personally hand a student a piece of paper. In the online environment, unless we are in a synchronous setting where I push the document to the student or have created a recorded session that allows for documents to spontaneously show up in students’ faces, there is no guarantee a student will even find the syllabus or other structural document. There are several publications that support the need for online courses and online instruction to be highly organized and to have clear expectations readily available. Southern Regional Education Board (SREB)’s document, Standards for Quality Online Teaching (2006) (abbreviated here as SQOT) states, “Teacher expectations are also a significant factor in how much and how well students learn.” In my principle, not only do teachers have to have high expectations, they need to communicate them. SQOT (2006) goes on to mention how important it is for a syllabus to be available online that not only includes the teacher’s expectations, but grading criteria and any other pertinent course organization (p.5). Palloff and Pratt (2007) describe their beginning documents which include “a syllabus, guidelines, and the accepted rules of ‘netiquette’” (p. 115). In addition, since they use discussion forums in their online courses, they state at the beginning of the course how they expect “a minimum of two substantive posts per week per participant” (Palloff & Pratt, 2007, p. 115). The National Education Association (NEA) Guide to Online High School Courses (n.d) also recommends a pre-class orientation or a specific introduction to help ease students into the mechanics of taking a course online. It also stresses the need for all necessary materials for the courses to be easily available to students (p. 21). Finally, SREB’s Standards for Quality Online Courses (2006) (abbreviated here as SQOC) wants course requirements to be consistent with course goals, “representative of the scope of the course, and are clearly stated” (p. 4). 2. Multiple modes are used to transmit information such that they overlap and there is some redundancy. To cater to different learning styles, teachers need to use a variety of activities and ways of communicating information so that students can take ownership of it. In the online classroom, this means that in some situations, an audio file needs to accompany a text file. In other situations, it is not enough to assign students to do a scripted lab; demonstration video needs to accompany the lab so students can at least see how to do the lab safely. If information is very important, there should be at least two ways it is communicated to students. Even a Voki to communicate an afterthought can be effective because it is eye-catching and will let students know that something has changed or has been updated. If students are not catching all of the assignments and how to complete them, then the teacher needs to find a different, perhaps redundant, way to communicate what the assignments are and how students can be successful. Publications supporting the use of multiple modes of transmitting information include SREB’s documents: Standards for Quality Online Teaching (SQOT) (2006) and Standards for Quality Online Courses (SQOC) (2006). In SQOT (2006), they say, “The teacher differentiates instruction based on students’ learning styles and needs and assists students in assimilating information to gain understanding and knowledge” (p. 4). The differentiation can use synchronous and asynchronous tools including multimedia and visual resources (p.3) that let the instructor “adapt and adjust instruction to create multiple paths to learning objectives” (SQOT, 2006, p.6). To support the idea that a variety of modes are used to communicate information, the SQOC document (2006) elaborates on how the online course provides “opportunities for interaction and communication student to student, student to instructor, and instructor to student” (p.4). “Courses must utilize technology that enables the teacher to customize each student’s learning experience through tools and formats such as video, interactive features, resources and links to related information” (SQOC, 2006, p.1). If these features restate course objectives or instructions on how to complete assignments, as long as the information does not contradict itself, the more modes of communication, the better. For students who can easily acquire and process information, the instructor can advise them through a path in the course that has fewer redundant resources. It should not be a scavenger hunt where a student needs to access all of the communication methods to get a complete picture; instead it should be a complete picture that has various points emphasized in alternative ways. SQOC (2006) also points out the need for courses to meet “universal design principles, Section 508 standards and W3C guidelines to ensure access for all students” (p.7). This means the teacher may have to “adjust the scope and sequence of instruction to meet students’ academic and learning needs” (SQOC, 2006, p.2). In addition, “the design reflects a clear understanding of student needs and incorporates varied ways to learn and multiple levels of mastery of the curriculum” (SQOC, 2006, p.4). To communicate expectations, “each lesson includes a lesson overview, content and activities, assignments and assessments to provide multiple learning opportunities for students to master the content” (SQOC, 2006, p.4). To further differentiate instruction, “the course makes maximum use of the capabilities of the online medium and makes resources available by alternative means; e.g., video, CDs and podcasts” (SQOC, 2006, p.7). 3. The learning process is dynamic. Students interact with information, ideas, and each other in addition to receiving static methods like taped lectures or videos. In the face to face classroom, there are multiple ways to have students interact with information, although in many classes the lecture is used as the primary conduit of content. Lectures are pretty static- they often do not involve any student interaction or participation. In contrast, inquiry based assignments in the classroom engage the students to ask questions or to take control of some aspect of the learning environment. Online inquiry can look like the discussions in forums if students are asking questions that other students are answering. Having students create “new” ideas because of their interaction with online discussions, creating wikis with others, taping a Jing presentation to demonstrate what they have learned, or creating an animation to explain a concept are far more interactive than listening to the teacher talk. Rice (2012) suggests activities like “question generation, hypothesis development, and defense of ideas” in collaborative environments (p. 31). The online learning environment needs to be more student-centered than the one in a typical face to face classroom. Online, something other than the teacher is the source of information. According to Palloff and Pratt (2007), “the responsibility for learning falls to the learners in a learner-centered approach and the focus is on learning, not on grades” (p.106). Other publications reinforce the idea that online learning needs to be student-centered and active (Rice, pp. 74-78; SQOT, pp. 4 and 6). The teacher serves as a “guide on the side, an instructor, a group process facilitator, and an advisor.” The guide gently encourages students to participate in what may seem like new educational circumstances, the instructor ensures what happens in the classroom runs smoothly, the group process facilitator monitors student interactions online, and the advisor is not only a stable adult for the children, but also serves as a resource parents can rely upon for direction on how to maneuver the online school setting (Rice, 2012, pp. 74-78). By providing such opportunities, “information literacy and communication skills are incorporated and taught as an integral part of the curriculum”(SQOC, 2006, p. 2). On page 14, the NEA Guide to Online High School Courses (n.d) outlines similar expectations for online classrooms. The course makes maximum use of the online medium by incorporating primary source materials, media, outside experts, and resources beyond the geography and culture of the students’ brick-and-mortar classroom experience. They give examples of how to make courses interactive. Students utilize “a variety of media and resources” as they “learn from multiple viewpoints.” Their lessons may include online discussions, lab experiments, designing projects, writing critiques of what they read, writing lab reports, using multimedia to create a product, or having online group activities to teach collaboration skills (NEA, n.d., pp. 14-15). Palloff and Pratt (2007) elaborate on why a variety of teaching techniques and student-centered activities are necessary. They urge instructors to be facilitators who use “a variety of learning activities and demonstrate instructional methods other than lecturing. Draw out creativity, innovativeness, and ideas in a collaborative manner” (Palloff & Pratt, 2007, pp. 109-110). The facilitator allows “students to explore the course material… without restriction” (Palloff & Pratt, 2007, p110). Students may make comments about the reading material in discussion forums where the content is further explained or clarified. They go on to elaborate on other researchers’ ideas of how online learning is facilitated such that the students are actively involved with the process of creating curricular material. This perspective is called a “teaching presence” and it often involves students facilitating discussion forums (p.111) or providing ideas on surveys administered during the course. 4. Safe, sociable, and legal practices are demonstrated and are taught to students. Safe practices include what information to disclose or not disclose in an online environment. Sociable practices include using academic language and informing students of typical netiquette expectations. The online course can contain a social forum where students can be more casual with their language. This reinforces the idea that in the content forums, more appropriate word choices are necessary (Palloff & Pratt, 2007, pp.112-115). Legal practices include teaching students about how to appropriately use information they find online including copyright laws, what constitutes plagiarism, and how to evaluate information found online to ensure it is accurate and reliable (SQOC, 2006, pp.3-4; SQOT, 2006, p.5). If needed, the instructor can create a set of Acceptable Use Policies (AUP) if the school does not already have students signing one upon registration (Rice, 2012, p.242; SQOT, 2006, p.5). The NEA Guide to Online High School Courses (n.d.) refers to this type of knowledge as “Information Literacy,” whereas Rice (2012) calls it “Digital Literacy” (p.241-242). NEA’s publication (n.d.) encourages instructors to have students complete lessons that teach them how to evaluate appropriate online resources, how to judge the credibility of what is published online, and how to maintain respect for copyright or other intellectual property they would like to use for their own projects (p. 15). 5. The teacher has been an online student in at least two different settings. In order for teachers to understand the frustrations that online students can have, they need to walk the walk themselves. Future online teachers need to experience the different ways that instructors can organize discussion forums, due dates, documents, expectations, or other mechanical qualities of the online setting so that they can be aware of some of the circumstances that can cause student frustration. The more exposure, the better; however, if I’m going to write a principle that leads to a standard, I want to quantify that there needs to be at least two experiences with different instructors. Rice (2012) recommends online teachers have “online course experience as a learner” (p.41). Both SREB (2006) and NEA (n.d.) want online instructors to have had at least one experience with being an online student and/or some training on how to be an online teacher (SQOT, 2006, p.6; SQOC, 2006, p.8; NEA, n.d., p17). 6. Assessment includes more analysis than determining the students’ ability for taking multiple choice tests. For more advanced courses like those for college or other adult levels, small group collaboration or case study analysis that yields a collaboratively written paper or project can serve as an alternative assessment to a fact-based test (Palloff & Pratt, pp.115-116 ). 7. Curriculum is modified on a regular basis by the person teaching the course. The class is not merely static lessons developed with the idea students will have to adapt themselves to the curriculum. The content and its delivery needs flexibility that allows for individualized instruction and assessment when needed. The teacher is given the power to change the curriculum, activities, and assessments based on the information s/he gets from students and their progress. Resources supporting these ideas include Standards for Quality Online Teaching, 2006, p. 7; Standards for Quality Online Courses, 2006, p.8; NEA, n.d., p. 22; and Palloff and Pratt, 2007, p.115. Paloff, Rena M. & Pratt, Keith. (2007). Building Online Learning Communities: Effective Strategies for the Online Classroom. San Francisco: Jossey-Bass. Rice, Kerry. (2012). Making the Move to K-12 Online Teaching: Research Based Strategies and Practices. Boston: Pearson. Check discussion forums daily to see if there are new posts. Check email to see if students tried to contact me. See who has turned in assignments. If students who did not turn in assignments are on an IEP that requests they get additional nagging, nag them. Check to see what is coming up for due dates and post a reminder in the news forum or similar place. If there is a synchronous session about to happen, check my audio and video equipment to make sure they are working properly. Find a parent to call with good news. See if there are parents to call with less than happy news. Grade anything that needs to be graded. Write feedback to myself about how well things are working so I can note what needs to be changed the next time I teach this topic. Why is person’s ideas realistic, successful, or other adjective? I liked Adam’s suggestion of using a discussion forum as a way to do a jigsaw. Have questions already posted, students pick one question to answer, then they respond to something someone else said. Send students on a mission to find something online. It could be a picture, an explanation, or a specific website that gives specific information about a topic. They need to come back and share what they found to the rest of the group. Like we do here in the EDTECH program, students can post their unique projects to a forum for others to evaluate and to give feedback or suggestions for improvement. If there is a challenge question, you can have the forum set up so that you can’t read anybody else’s posts until you make one yourself. So let’s say there is a dilemma and you ask students to problem solve it. Each person needs to put up their own solution before they can read everybody else’s. I liked Glori’s idea of doing case studies. People would propose their recommendations for their case study. Then they would examine what everybody else put up to formulate a better idea or guide their peers toward more in depth thought. Ethical dilemma- students brainstorm how to solve an ethical dilemma. This is similar to a case study, but far less involved. Positive feedback with words in the forum or through a personal email. Bribery with extra points as an incentive to just get students to be on the board. Ask students to talk about themselves. Let the discussion area be student-centric at least at first. Let students take ownership of the space before you squish their brains by having them expand their content knowledge in a forum. Use icebreakers. Our class came up with some amazing icebreakers to get students to share something about themselves. My peers did a wonderful job of organizing work we have done in the class and collected our icebreakers here. Do landscape style summary posts to recognize at least one contribution from each student up to that point. Although I will have a list of netiquette suggestions available in our first section, I want to invite students near the beginning of the class to share reasons why netiquette is important. I would also like to discuss what bullying looks like and why it is inappropriate. Some students may not realize that what they say is interpreted as bullying so I want to make sure students are aware of how to make our space safe. In this discussion I also want to include a review of what type of information is OK to put online, what information should not be shared, and the differences between where our class discussion happens and social media in general. Within this discussion I also want to point out why “I agree” or “Hello” posts are ineffective. I want to have a survey always available for students to give anonymous feedback. I will address their feedback somewhere in the course so they can see that I am taking their suggestions seriously. If they know I care about their ideas and find them to be valid, maybe they will share more of them within the real forums? What is in chapter 7 will be very valuable. At the moment it is very difficult for me to hypothesize what my online classroom will be like because I have yet to experience an online classroom where I have freedom to make decisions like the ones that are described in many of the samples in chapter 7. I can make a list of what students can expect from me, though. Feedback from emails or phone calls within 24 hours. Someone who cares about students’ academic lives. Someone who expects students to make mistakes and to use those mistakes as learning opportunities. Someone who has high expectations and therefore will push every student to succeed. I will happily listen to challenges students face and will brainstorm with you ways to conquer currently perceived obstacles. I am using the PBS rubric and Alexis Alexander’s rubrics to guide my discussion board rubrics. These rubrics rely on students being able to physically start a new thread when they reply to a general question. There is a diagram at the end that shows a graphic for how this type of forum can work. Provide an additional source that contributes to this topic that was not already provided in the course material. Tell us why you think this is appropriate. When did you post? Your first response starts a thread within 4 days of the forum opening. Your follow up two posts are within two weeks of the forum opening. You are not limited to only doing two follow-up posts; this is the minimum required. Your first response does not start a thread, but your posts stimulate discussion in the forum. Your first response happens later than 4 days after the thread starts, but it still stimulates discussion. Your first response does not start a thread, nor do any of your responses stimulate discussion. Your first response happens after 4 days after the thread starts and it does not stimulate discussion. What did you post? Initial post and responses are on topic, demonstrate thorough understanding of it, and stimulate other people to think. Initial post and/or responses are somewhat on topic, demonstrate some understanding of it, and/or stimulate some productive discussion. Initial post and/or response are off topic, demonstrate faulty understanding, and/or do not stimulate any additional productive comments because of the quality of what you posted. Usefulness of posts? What you say contributes to other people’s schema. Others can use your ideas to generate their own, or to expand their thinking. You are able to get other people to consider a perspective that they may not have already thought about. What you say does not stop discussion, although there may only be a few people who can relate to your suggestions. Your posts are difficult to understand, do not provide concrete ideas others could use, or are very limited with their application. A forum set-up so that discussions have threads. 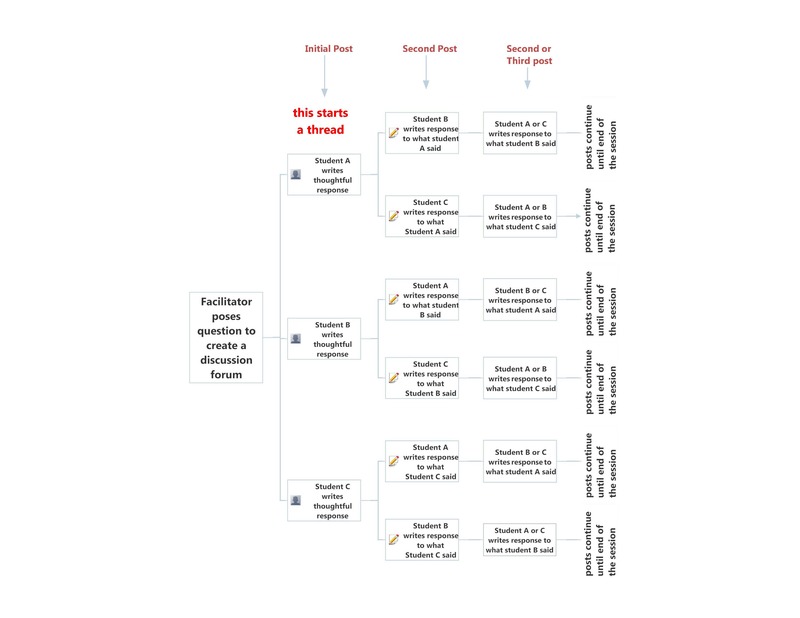 DiscussionParticipation is a pdf copy of the diagram. Naturally there are more than three students in the course. The idea is that each person does an initial post before writing a response post. You continue to write response posts until you run out of ideas. Teaching presence- is it possible? Several education scientists have published their views on how discussion forums work. They analyze what students say, when they say it, how things are said, and anticipate the learning outcomes based on this information. There are three main presences that have been described: social presence, cognitive presence, and teaching presence. Much of our discussion in this class has focused on the social presence because that is the perspective our book, Paloff and Pratt (2007), uses when they explain how they see online teaching and learning will happen. To be thorough, they mention other presences even though they do not go as in depth with them. In 523 we had the opportunity to try out the teaching presence. Although I am usually an advocate of putting as much as possible into the hands of the students, I do not advocate having students lead discussions. I know that it is essential for those who want to be discussion leaders to be trained in how to facilitate a discussion and for some people in our class, this was their first opportunity. I bet it was amazing for them and they will have learned skills they did not realize could exist. At what expense is this done to the other students? For this class, participating in the discussions was not a priority for me because I kept doing it wrong and therefore did not get the validation I am used to having in online classes that have active discussions. I think this is my twentieth online class so I arrogantly consider myself to be very experienced with how to maneuver in discussion forums. As you can see above, I am very much in favor of giving students the responsibility of starting threads. Within their thread, they own the pathway if they choose to respond to people who reply within that thread. I see it happen often in the 506 posts- we put up our image and people offer suggestions or ask questions. A dialogue forms between the one who started the thread and those who choose to volunteer their insights on the image that was posted. In a way the original poster can assume a teaching presence, although many of the replies to the original post are actually suggestions on what to improve and how to do it. In that way, a teaching presence can be seen in many of the posts. In courses where the instructor oversees the path of the discussion, I rarely see a teaching presence allowed to happen by anybody except for the instructor. Even in some classes where students form their own threads, when the instructor posts in the threads, sometimes the discussion becomes one on one between the instructor and the person who started the thread. For me, I do not see that as being a productive use of time and space. Instead I think instructors should use email to directly address some of their questions designed to move a discussion forward that really only push one person to volunteer ideas. I see the instructor’s responsibility to help unify the group and interpret what others have said so that the ideas can get broader and more diverse. I am not convinced that students who have not had training in techniques that can be used to broaden discussions should be made the discussion leaders. Instead, I think students should be responsible for starting threads so they can have a microcosm of the discussion under their guidance. The instructor can still step in and offer engaging questions, but they do not have to be the only ones demonstrating a teaching presence. Teaching presence actually has two “definitions”. Both have to deal with who is guiding a discussion, but one focuses on the teacher and the other focuses on the students. For the community of inquiry, the focus is on how well the students are able to guide the discussions. The research does not measure what a good job the instructor does of being the guide on the side. It measures how often or how well students step forward to cause inquiry to happen. In other words, are students posing the questions that guide future discussion or is the only one posting questions the instructor? Be careful if you decide to research the teaching presence because some people elaborate on how an instructor can manifest their presence in the discussions rather than how to get students to take leadership roles in the discussions. When students take on the leadership roles, then they are exhibiting a teaching presence. Chapter 8 in Palloff and Pratt elaborate on how to get students involved in the class. They have sections called, “Dialogue as Inquiry” (p. 170), “Encouraging Expansive Questioning” (p. 171), and “Sharing Responsibility for Facilitation” (p. 173). Although they don’t publicize that they are giving strategies for creating a Community of Inquiry or for getting students to develop a teaching presence, their ideas in chapter 8 align with those theories. Garrison, Randy D. and Vaughan, Norman D. (2008) Blended Learning in Higher Education.